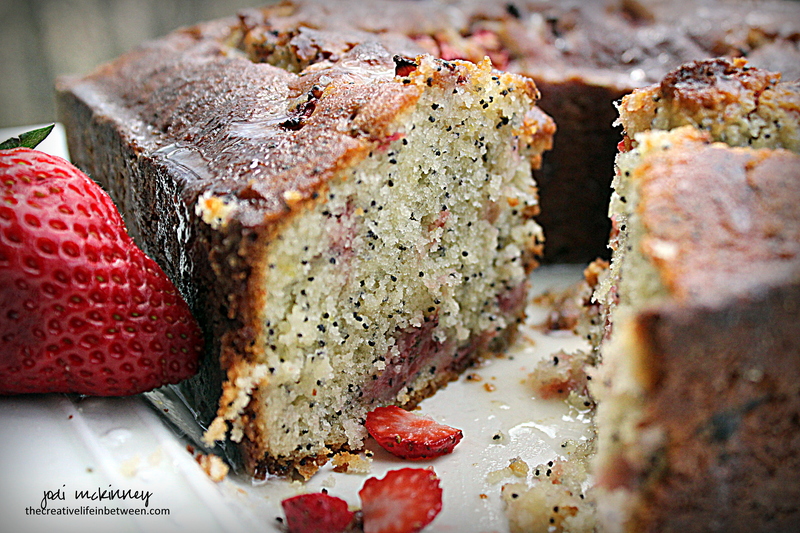 Fresh Strawberry & Lemon Poppy Seed Cake. If you know me at all, you know Poppy Seed Cake is my favorite of all cakes. Unusual to most I’m guessing, but most significant to me because my Grandma always made it for my birthday (New Year’s Eve) since everyone is just about over it with sweets by then after the holidays. 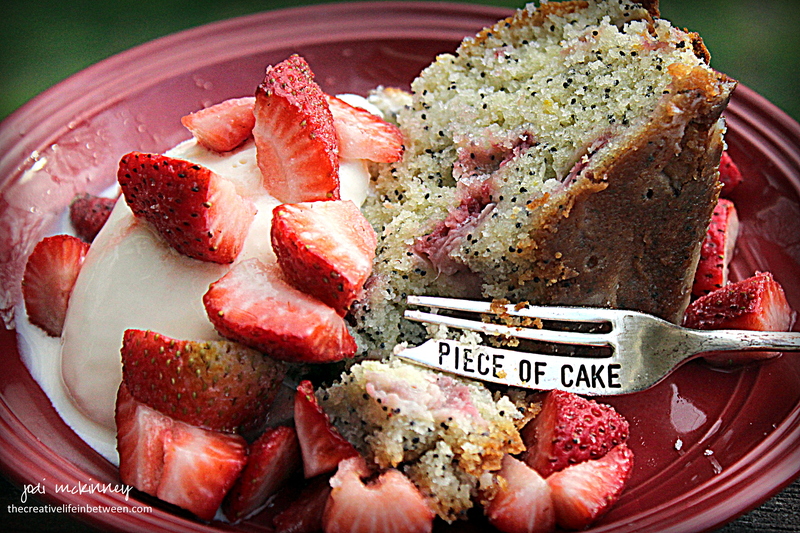 I had some fresh strawberries that were on the verge of going bad and lemon on the brain from a cookie I was making for the wedding cookie table, so I decided to whip up and “zip” up a poppy seed cake for Easter Sunday. 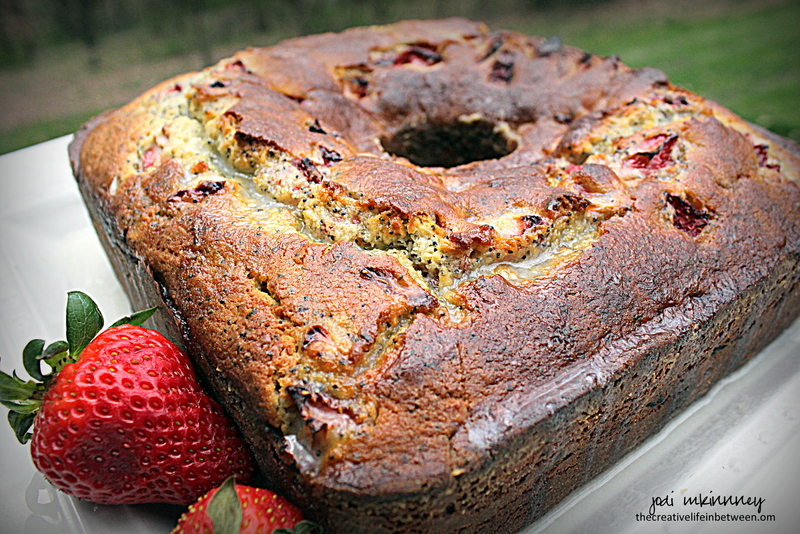 A bit of tart and sweet lemon zest in the batter along with chunks of juicy red-ripe strawberries and a thin lemon glaze really “Spring”ed up my usual wintertime poppy seed cake craving. Hubby loved his with a scoop of vanilla ice cream and an extra handful of fresh strawberries on top. If you are looking for a fresh, not too sweet, but yummy Spring cake to serve, give this one a try. It is truly delightful! Preheat oven to 375 degrees F. Grease and flour a fluted cake pan or your favorite. In a large bowl, beat together the melted butter, sugar, and lemon zest. Add eggs, one at a time, fully incorporating. Add milk, yogurt and vanilla next. Stir in dry ingredients until combined. Gently stir in strawberries and poppy seeds. Pour batter into prepared pan and bake for 50-60 minutes, or until cake test inserted comes out clean. Prepare glaze by mixing lemon juice and powdered sugar until sugar is completely dissolved, then stir in milk until smooth. Set aside. Cool cake for at least 20 minutes before drizzling with glaze. Serve with additional fresh strawberries and ice cream, if desired. Thanks so much kerfe. I love poppy seed cake! I like poppy seed bagels, so I’m sure I would like cake too! Something I never heard of but sounds really good! Wow Jodi awesome and what an amazing presentation of this yummy cake. Delicious. Looks yummy. I am sure I would love it. What a great combo . 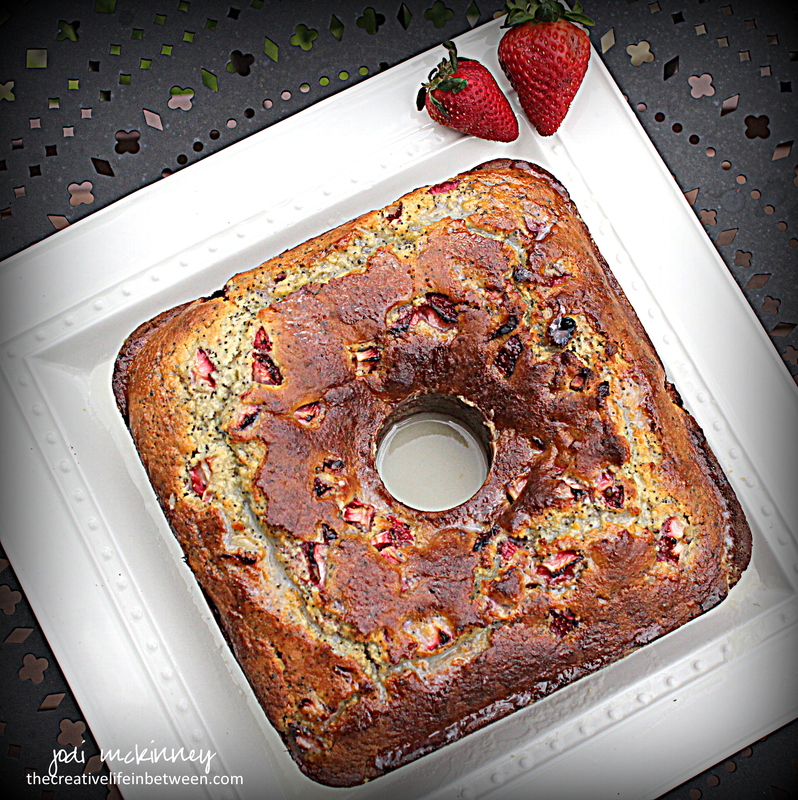 Love the square bundt pan!! Looks very yummy! I thought it was pretty too. I seriously often want to bake something new just to photograph it LOL! adding to the list… 🙂 We might have to narrow down to the top 10 for your visit though – LOL! We’ll discuss! Hugs Buddy! a festival for the taste buds! Ooh a square bundt, how fun! If breakfast muffins are offered to me I always pick the lemon poppy seed. The strawberries on top close the deal! Me too Always the poppy seed muffin! Oooo! Yummy. Looks delicious. Lovely photos. TFS recipe. Oooh Yum.mmmmmm. Love almond poppyseed muffins! Now you created all my favorites. Love lemon, strawberry, land especially ice cream. I’m going to get so fat with all your tempting creations. Never seen a square buntd pan or angel cake pan ? Not sure what your pan is. Very Cute Fork. So cool. Almond poppyseed sounds wonderful toooo! Oooh this is heavenly !